Peanut Butter cookies are one of those things that I always forget about when deciding to make biscuits. 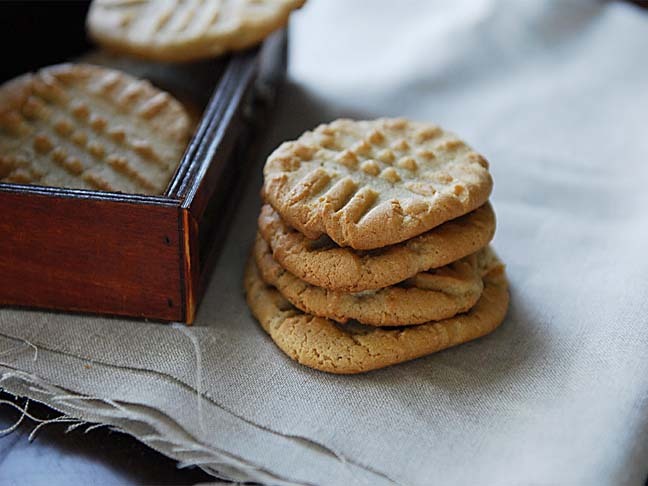 I don’t know why… we all love peanut butter cookies, but they aren’t ever the first idea to pop into my mind when it comes to baking. The school holidays are actually the perfect time to indulge in this treat. With nuts banned in most schools, we tend to ban them at home too. I’m paranoid that an afternoon biscuit treat will result in an errant crumb giving a kid anaphalaxis the next day at school. If you make them with the kids, they are an activity and an afternoon snack in one. To me, the perfect peanut butter cookie has to be soft and chewy on the inside and slightly crispy around the outer edge. No matter what, biscuits like these must be accompanied by a tall glass of milk, don’t you think? I’ve been messing around with recipes for as long as I can remember, searching for that “perfect” peanut butter biscuit recipe. This recipe is currently on the top of my list for cookie perfection. It’s a definite keeper of a recipe, perfect for an after school snack or a lunch box treat. In a medium bowl combine flour, baking powder and salt. Mix well with a wire whisk. Set aside. In a large bowl blend sugar and butter and mix, scraping the sides of the bowl. Add eggs, peanut butter and vanilla, and mix at medium speed until light and fluffy. Add the flour mixture and mix at low speed until just mixed. Drop by rounded tablespoons onto an baking sheet lined with baking paper, at least 5 cm apart. With a wet fork gently press a crisscross pattern on top of cookies. Bake for 9-12 minutes until cookies are slightly brown along the edges. Transfer cookies immediately to cool surface with spatula.